To wrap up our last weekend of our showcase tour, we will be traveling to Coppell, Texas, to visit Spirit of Texas! The showcase is split up between two different days. On Saturday, December 1, the first team takes the floor at noon with the last team wrapping up at 1 PM. Day 2 of the showcase will be for Level 4 and 5 teams beginning at 3 PM. Both days will take place at the Spirit of Texas gym in Coppell! Last season, Royalty placed second at the 2018 Cheerleading Worlds in the Senior Medium Coed division. Take a look at their routine! Spirit of Texas also took home a few titles at The Summit 2018. Purple Diamonds came out on top in the Small Junior Level 2 division, and the Junior Royals placed second in the Small Junior Coed Level 5 division. We can't wait to see all of the talent from this purple program! Also, be sure to also check out the six-part series Spirit Of Texas A-Team: Making The Grade! It's our last showcase weekend and we can't wait to spend it in Coppell! FloCheer will NOT be Live streaming the showcase, but stay tuned for the most up-to-date coverage through pictures, social posts, interviews and more! 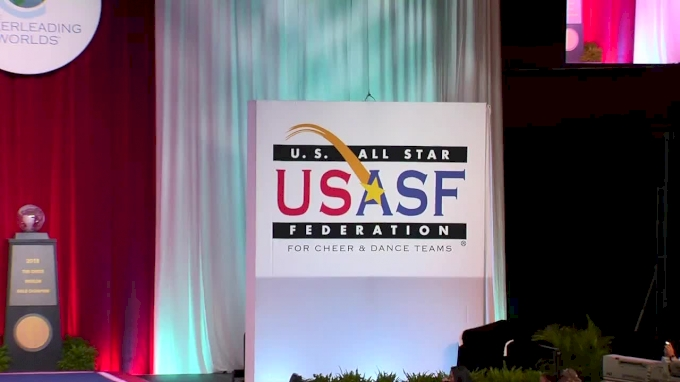 Get the best competitive cheerleading news straight to your inbox. The 2019 Cheerleading Worlds Division Breakdowns Are Out! All star cheerleading teams from more than 40 countries will make their way to Orlando, Florida to compete at the most prestigious end of season championship event, The Cheerleading Worlds 2019. The time of year we’ve all been waiting for is almost here! The Cheerleading Worlds 2019 is the most anticipated competition of the season and although you’ve been following your favorite teams throughout the year, anything can happen on the Worlds mat. Don't Miss The International Open Small Coed Level 6 Division! All star dance teams from more than 40 countries will make their way to Orlando, Florida to compete at the most prestigious end of season championship event, The Dance Worlds 2019.
Who Will Win The First Senior Open Large Coed 5 Title? Senior Open Small Coed 5: Will Beatles Win Their First Title?